This degree programme prepares students for entry into the fast growing and exciting investment industry. It provides a practical knowledge of portfolio management and quantitative finance, together with an applied set of courses looking at industry structure and trends. Students benefit from professional guest speakers drawn from the the global investment industry in the City of London. During the course you will develop expertise in a range of specialised areas such as trading strategies, portfolio and fund management, alternative investments, ethics in investment management and risk management, among others. You will also have the opportunity to apply this knowledge in practice through the use of simulations, the latest financial software, case-based learningand take part in the portfolio management challenge designed for MSc Investment Management students. Integral to the academic course is the parallel study of the Chartered Financial Analyst® (CFA® ) programme, level 1. The two programmes support and reinforce each other, ensuring that graduates acquire both the academic and professional knowledge and qualifications required to succeed in the investment management industry. The tuition for this programme includes the candidate’s registration in the June CFA Level I exam that is written just after the end of the academic year. The tuition also includes substantial CFA teaching outside of the academic teaching. 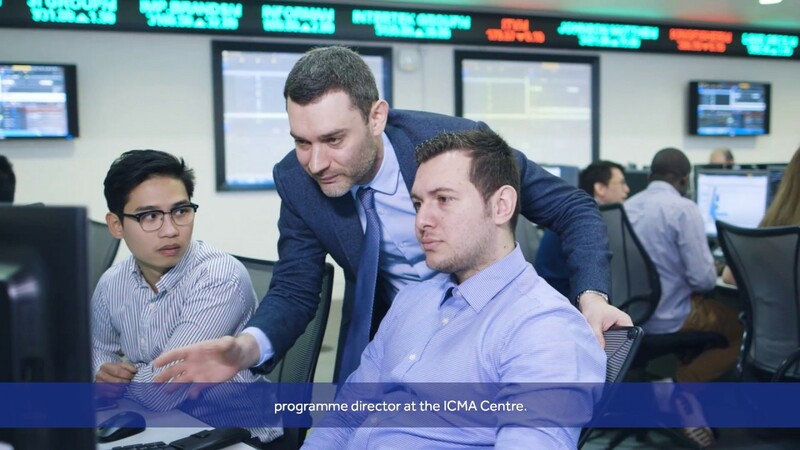 The ICMA Centre is a CFA University Affiliate; this is in recognition that this degree covers at least 70% of the CFA Program Candidate Body of Knowledge, the CFA Institute Ethical and Professional Standards, and other requirements. After completion, our graduates are qualified to work in a variety of investment functions, including as portfolio managers, hedge fund managers and traders, within a diverse range of organisations such as investment banks, regulators, fund management firms and consultants. The wide recognition of the programme contributes to the majority of our graduates securing employment offers within 6 months of graduation. Current Topics in Investment Management is an applied debate on the issues and trends affecting the investment management industry and as such the topics may vary and/or be updated on a year- to-year basis. The purpose is to give the student a clear overview on industry structure and the forces of change – something that has been identified as a key information need by investment management firms in regard to their future management hires. Although stand-alone topics, they will be integrated by usage of an industry model for competition such as that advanced by Michael Porter to show the interaction between the various financial players, underlying trends in demographics and government regulation. The student will be exposed to guest speakers in the form of industry practitioners and have the chance to debate current trends. Ethics in Investment Management offers a series of lectures that explore the main ethical conflicts encountered by investment professionals as they invest other people’s money. It will examine the causes and consequences of both ethical and unethical behaviour, giving students the chance to see how individuals’ decisions affect a range of stakeholders. Some of the topics covered in this module feature in the CFA ethics syllabus, but this module is not a substitute for the specialist training for the CFA exams.